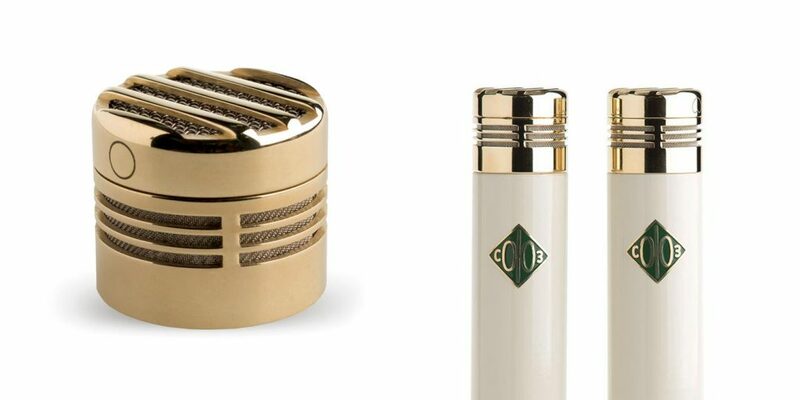 2019 is the 20th Anniversary of Universal Audio’s rebirth, and over these past twenty years UA has brought classic vintage hardware such as the 610 mic preamp, the 1176LN, and the Teletronix LA-2A back to life. UA has also been an innovator in the field of audio plug-ins and DSP processing with the UAD Powered Plug-In platform. Seven years ago, in 2012, UA’s hardware and software expertise came together seamlessly with the introduction of the Apollo series of interfaces. Within the Apollo, you get an audio interface, digital conversion, UAD DSP plug-in processing, and one of UA’s greatest modern innovations: Unison, a technology that allows Apollo preamps to emulate well-known tube and solid-state designs. At last year’s 2018 AES conference in New York, Universal Audio premiered the new third-generation Apollo X series, with four new models—the Apollo x6, x8, x8p, and x16. Each one is a Thunderbolt 3 interface sporting upgraded converter designs, dual crystal clocking, +24 dBu operation, Unison Preamps (in all but the x16), and each unit offers UAD HEXA Core processing. As of NAMM 2019, each unit offers the ability to be set up for 7.1 surround use (5.1 on the smallest model). All four units remain visually and functionally similar to the corresponding previous-generation models. Each one is housed in a single-space 19″ enclosure; in contrast to the older silver and blackface units, the new Apollo X models feature a brownish copper color similar to the latest Apollo Twin MKII reviewed in September 2017. With the exception of the x16, all of the X models feature the same layout, control set, and metering layout. The first three units contain dual encoder controls flanking an LED-equipped function and meter display. There are 6 buttons for accessing preamp features and 3 for function and monitor controls. There is a pair of front-mounted 1/4“ direct instrument inputs, dual independent headphone outs, and a front-panel power switch. The x16, like its predecessor, features only a single encoder control, 3 function buttons as it has no onboard preamps needing controls, and a power switch. The line starts with the Apollo x6. This unit is a 16×22 interface with a pair of Unison preamps, 6 rear line ins, 8 line outs, S/PDIF over RCA I/O, ADAT SMUX, BNC word clock and a pair of Thunderbolt 3 ports around the back. The Apollo x8 is an 18×24 device with 4 Unison Preamps, 8 line inputs, and 10 line outs—2 of which are dedicated to monitor output. The rest is the same as the x6. 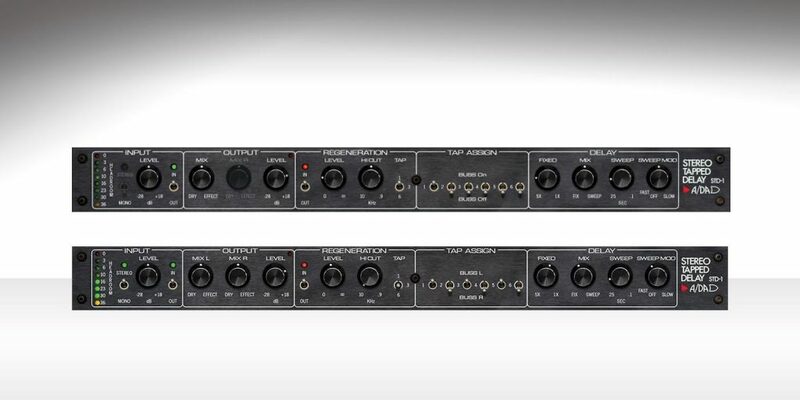 The x8p is a 16×22 interface and changes things up a bit with 8 Unison preamps via 8 Neutrik Combo jacks. It also has an additional 8 x 8 line I/O via a pair of D-Sub connectors, and a set of 1/4“ balanced monitor outs. The rest is the same as the x6 and x8. The x16 is an 18 x 20 interface with 16 of its line I/O on two pairs of D-Sub connectors along with a set of balanced XLR monitor outs, a pair of XLR AES digital I/O, word clock, and the TB3 ports. Each of the units is powered via a large external line lump power supply. 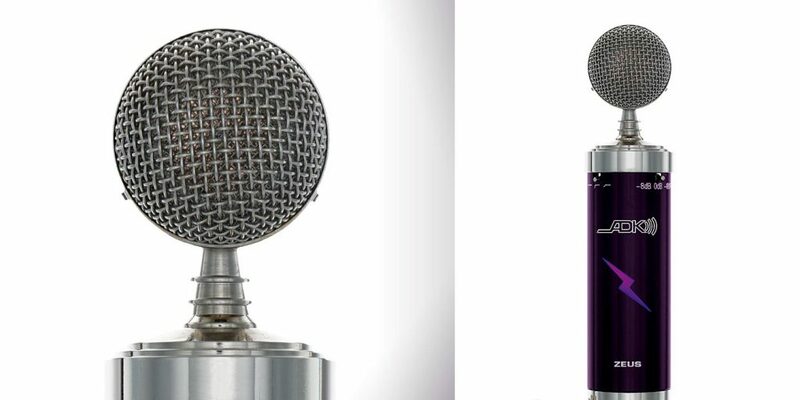 There are three significant improvements making their debut in the Apollo X series. 1. Clocked and converted: For clocking, the Apollo X utilizes newly-designed Dual-Crystal clocking with separate dedicated crystals—one for 44.1/88.2/176.4k and the other for 48/96/192k sample rates. According to UA, this results in less than 10 picoseconds of clock jitter. In the real world, this improves the sonic accuracy, imaging, and depth of your recordings. The conversion circuitry has also been upgraded. The x6, x8 and x8p all offer 129 dB dynamic range and –119 dB THD+n. The x16 specs out even better, with 133 dB dynamic range and THD+n of –129 dB. Each unit can now also be globally set to operate at +24 dB, which is handy if you want to integrate an Apollo X with a console or external hardware processors. For compatibility with previous models, there is also a choice of +20 dB as well. 2. I put a HEXA on you! 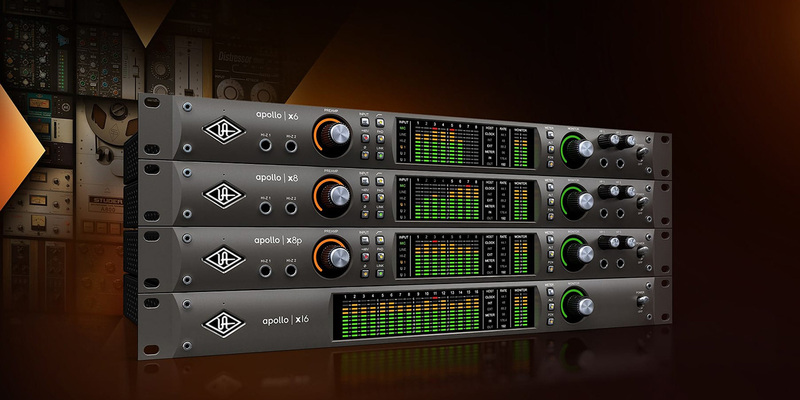 : UAD processing has been a hallmark of the Apollo series since day one. On previous-generation models, you could choose between 2-core DUO or 4-core QUAD units. That was great seven years ago, but as UA’s plug-in modeling continues to advance, so too does its hunger for CPU power. For that reason, all four Apollo X units come stock with matching 6-core HEXA processing. That’s six Analog Devices SHARC chips per unit… which ain’t too shabby! I personally have two UA setups: an Apollo Twin MKII QUAD in my office/edit suite that I regularly max out in mix sessions, and a Thunderbolt UAD Satellite OCTO in my studio that I rarely max out. So a HEXA Core sounds like a great just-right solution to me. I also appreciate the standardization across the platform of having the same number of cores per unit. Also having a HEXA on the x8p means that you won’t need to worry about running out of DSP power when adding UA’s excellent preamp models to all eight Unison preamps. 3. Thunderbolt 3: Not so much a new feature as it is a fact of life in the computer age. Just as USB 3.0 is starting to give way to USB-C, so too is Thunderbolt which is now at version 3.0 and uses USB-C rather than the old Thunderbolt/Mini DisplayPort cables and ports. All four Apollo x interfaces are Thunderbolt 3 only, but fortunately they are backward-compatible with Thunderbolt 1 and 2 via a standard adaptor. More good news is that multiple Apollos—old and new, Satellite to Twin MKII—can be chained together with each other, as long as they are all Thunderbolt-based (you can’t add USB or Firewire units into the mix). Also know that as with 90% of the current Thunderbolt boxes on the market, no cables of any kind other than power are included when purchasing an Apollo X. Which Apollo or Apollos you choose depends on your needs. For many home studios, I think the x8 represents the best overall value, as it offers four Unison preamps along with the most raw I/O of all the units. hybrid in-the-box/out-of-the-box setup. I need 16 channels of I/O to route to my analog EQ, compressors, and other effects. In this instance the x16 is actually better than my previous interface because it gives me a pair of dedicated monitor outputs in addition to the 16×16 ins and outs, so I don’t need to sacrifice two outs for monitoring and be limited to 14 channels of processing. For this review, I was sent an Apollo x8p and an Apollo x16. I set them up together in a chain with my OCTO Satellite and the QUAD Apollo Twin MKII. If you are keeping score, that is 24 cores of UA processing. Spoiled? Overkill? Maybe. Glorious? Absolutely! generation Console app on your computer. Console looks like a traditional mixing desk, complete with inserts and aux sends. With these you can both track and/or monitor through UA plug-ins, including the Unison preamps. The Console scales itself automatically based on which interfaces are connected. Although you can easily ignore it and work without it in your DAW as it pertains to I/O, routing, and monitoring, there are some great benefits in adapting your workflow to the Apollo paradigm. As an input console, it offers lower latency when tracking than your DAW might, especially when recording with (or better yet, through) UA plug-ins. For instance, I have been enjoying tracking through UA’s various tape machines on the way into my DAW and committing to a sound, rather than adding them as a plug-in later. Using the Console app lets you create cue sends for performers, One great touch is that all of the headphone outputs on any device will be live and each can have its own individual cue mix or the main mix, even on a single Apollo. It is similar with talkback: each Apollo unit is equipped with its own built-in talkback mic. This is where adding an Apollo Twin MKII to your system to sit on your desktop as a monitor controller and talkback device is very handy; it’s automatically selected for talkback when the network detects it. It’s also a handy place to plug in when you need more inputs! If you want to use Console as a monitor controller, you will need to choose one of your Apollo units to connect all of your speakers. If you have a single set of speakers, or multiple speakers on one Apollo, no problem—if you need alternate monitor outputs, you simply plug those speakers into additional outputs on that same unit. It’s kind of tricky to do this with the D-Sub outs on the x16, however. Also, in a multiple-Apollo setup, it would be convenient to be able to use the dedicated monitor outs on another unit for for your other monitors, but at this time you cannot. This isn’t a showstopper, but something to note. Wow, UA have completely upped their game with these converters! The sound is solid, clean, and very even—from delicate highs to full mids and the thickest of lows, all reproduced with stunning accuracy and detail. While the DA of the Avocet IIA, which is similar to the new Crane Song HEDD Quantum, is obviously mastering-grade and was subjectively a bit better than the rest, we were all impressed by how close the Apollo x16 came to it in overall quality. Daniel mentioned that the x16 was possibly his favorite; it gave him the same feeling and vibe as he was used to in his Burl-equipped room (Burl Audio converters are known for exhibiting a “punchy analog-ness” to their sound—make of that what you will.) All in all, this places the Apollo x16 in great company across the board. I’ll say it again, Universal Audio has really upped their game with the new X series Apollos. They sound stellar and compete with some of the best multichannel interfaces on the market, they now offer more UAD processing power, they are super fast and low latency, and are completely scalable based on your needs. It’s rare that a company packs this much power and options into a single unit without missing the mark on something, but UA has done just that. These can be a rock-solid, no-compromise centerpiece of any modern studio, which is what a recording interface should be. Even without UAD plug-in processing, these would be a great sonic addition to any setup, and with six UAD cores under the hood of every unit, there’s nothing out there that can touch them.